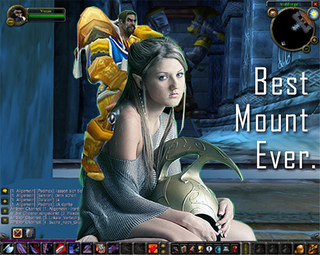 Just when you think the strange and terrible story of Whores of Warcraft (now just called “WhoreLore” since, I suppose, Blizzard might get their Paladin Epic Armor in a knot over, you know, having their Warcraft trademark appropriated by fine art) was almost just about over with everyone chuckling embarassedly and then averting their eyes, followed shortly by the banninating of real honest-to-god undead warlock/riot grrl Mia Rose from WoW chat for excessive literacy, now we have WHORES OF WARCRAFT II: THE PR0N STARLET STRIKES BACK. Truth is, we weren’t all that nice. We were sarcastic; but then again we’re always sarcastic. We really didn’t buy Mia’s story about her banning. We implied that there was a lot more to it than she was telling the world. Oh, and I called her “ugly”. Mia is fighting for her DIGNITY as the best epic mount ever. I hope that everyone is suitably cleared up now, and I suspect that this post will attract about 80 million spam comments asking you to buy V1agrA.